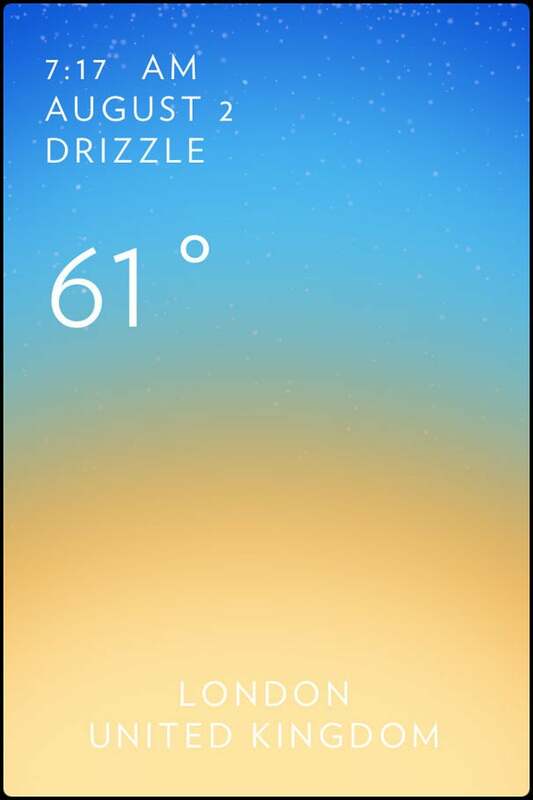 Most weather apps try to convince you to ditch the default Weather offering in iOS by adding more features. Solar takes the opposite approach, stripping down its weather report to essentially offer time, temperature, and condition-appropriate color patterns. Whether Solar tops what you already get for free from Apple’s built-in app depends on the value you place on aesthetics. Color Coordinated: Solar's minimalist screen shows the time and temperature and a color scheme that depicts current conditions. 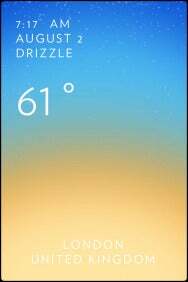 It also denotes drizzle with scattered raindrops on the screen. 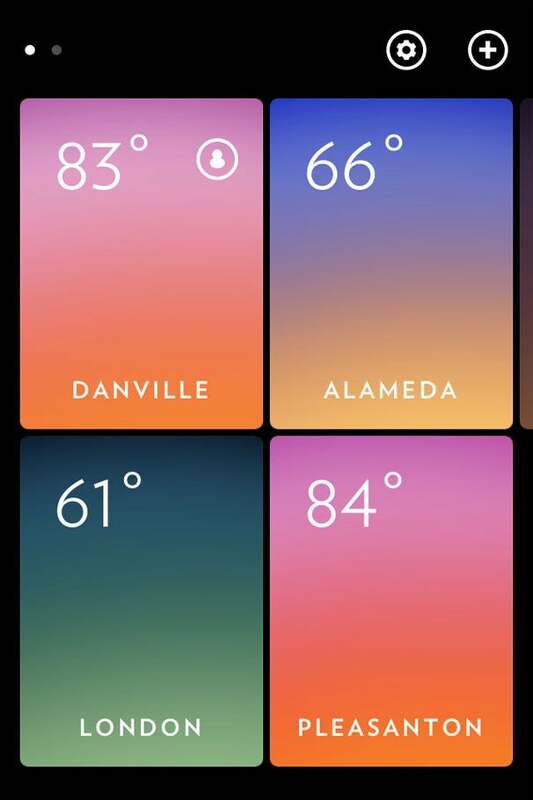 Because make no mistake: Solar is an awfully pretty app, relying on what it calls “Rothko-esque colorscapes” to not only tell you what the temperature is but to also depict current conditions. That’s Rothko, as in Mark Rothko, the abstract expressionist painter known for his use of color. A typical Solar screen stacks colors on top of each other; cooler temperatures have a bluish hue, while the colors become more orange and red as the mercury rises. Besides the handy visual reference, the app also displays time and temperature. In an especially useful touch, Solar takes advantage of your phone’s location-awareness features to always dispay the temperature for where you are. 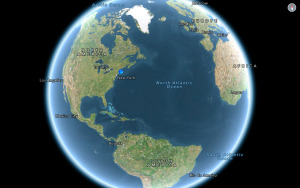 You can also add cities on your own, storing up to 20 locations within the app. Four-Sight: Double tap the Solar screen, and the app will display the other cities you’ve stored in a four-city-per-screen grid. Other reviews of Solar have praised the app for its intuitive controls. I didn’t exactly find them to be that way, figuring out most of the controls through trial-and-error and by studying a promotional video on the website of developer Hollr like it was the Zapruder film. Dragging your finger up the screen will show how the temperature will change over the next 24 hours. Pulling down displays a three-day forecast. A single tap makes the temperature and time data disappear, leaving you with just the colorscape. Double-tapping shows all of the cities you have stored laid out in a four-city-per screen grid. Eye-catching though Solar may be, I prefer the five-day outlook the built-in Weather app offers. I also think Weather’s hourly outlook is a bit easier to manage than the finger slide that Solar relies on. Still, Solar’s location-based component is a nice feature. And iPhone owners with a keener eye than mine will doubtlessly appreciate the colorful approach Solar brings to the weater.